Provantis 10 is the current gold standard for preclinical data collection. From the application’s infancy, Charles River has employed Provantis for efficient electronic data capture, enabling quick review, reporting, and real-time data access for our clients. Recently, in order to provide the most up-to-date system for both our operational teams and our clients, we needed to move our sites two levels from Provantis 8 (implemented in 2012) to Provantis 10. Our objective was to migrate ongoing studies without affecting data collection, integrity, study conduct, or reporting timelines. By using a phased implementation, providing adequate support to our teams, and keeping our clients informed, we were able to successfully and seamlessly move existing and upcoming studies onto Instem’s latest platform. The implementation of an upgraded and consistent Provantis data collection system across our Safety Assessment sites is imperative to both our clients’ drug development needs and our business. The challenge lay in conducting an efficient and effective move from Provantis 8 to Provantis 10 across 13 Safety Assessment sites around the world while ensuring minimal client and operational impact. What risk does upgrading to Provantis pose to our clients’ studies and our business operations? To reduce impact, make efficient use of resources, and ensure a smooth transition, it was decided to proceed with the migration in four waves. Four waves allowed the migration to move forward with no dependencies from one wave to another. Prior to the onset of each wave, several preparation meetings were held with the travel, site, and remote support teams, including a review the week prior to the migration to review timing and any last minute issues and/or reminders, and then a true on-site kickoff meeting the Friday of the migration wave. The team could experience the first wave together, understand the challenges as they arose, and learn from them for subsequent waves. It enabled immediate communication for the team and established and reinforced the handoff scenarios. It allowed for hands-on training for newer team members that would be supporting sites with smaller teams in upcoming waves. This experience highlighted the importance of on-site support and direct interaction with the site-supplied teams, and allowed us to confirm the on-site support each subsequent wave would need. These face-to-face migration teams arrived a day prior to the migration wave, worked tirelessly (16-18 hours a day) during the migration activities, and stayed on site to provide hyper-care support to operations personnel using the new version for at least two days. Additional attention was paid to sites that had migrated in previous waves, as well as sites that were still on the legacy version, ensuring support and guidance and handling any inquiries related to the application in the production environment. All hands were on deck; however, the distribution of experts was spread across the production support, migration activities, and post-migration hyper-care. 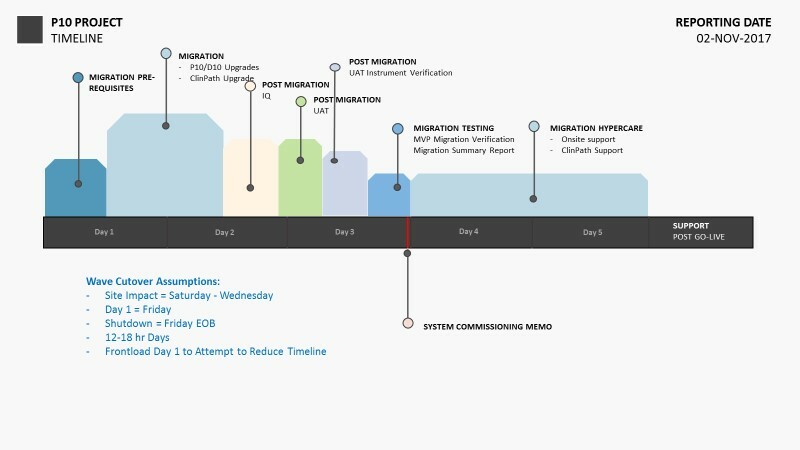 Lessons learned after each phase were broken down by technical migration issues and potential operational impact. The entire team, across all sites, reviewed these items prior to the next wave with the sites involved. A high level of communication between site resources, clients, and executive management was also maintained, ensuring that all stakeholders were well informed before, during, and after each migration wave. Clients were contacted approximately a month before each wave to determine any required mitigation for data collection and study activities in order to reduce or eliminate scientific impact. Shut-down times were tailored for each site, allowing the affected sites for each wave to choose their offline data collection periods based on study types and scheduled data collection activities. The team worked around the clock to enhance the workday and accommodate time differences. This allowed all four migration waves to be completed either on time or earlier than targeted. All sites employing Provantis 8 were successfully migrated to Provantis 10 in four waves between January and March 2018 with no negative impact.